Mon - Thurs: 9:30 a.m. - 7:00 p.m.
Water sloshed toward the lane line as six-year-old Casie Shore jumped into the pool for her first competitive race. The event was a 25-freestyle (for our non-swimmers, this is only one lap), and her uncoordinated arm flails and dragging feet barely inched her to the other side. When her arm reached out to grab the wall, applause erupted from the now-standing crowd who was celebrating the last competitor in the water making it to the other side. 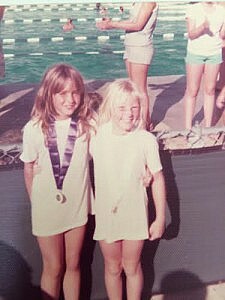 Three months later, she improved enough to help her relay team to the finals, and her obsession with the water was solidified. 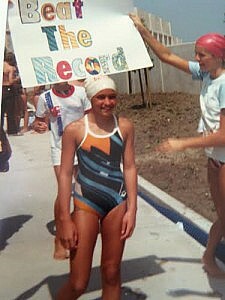 Four years later, she broke the Orange County Record and was ranked top 10 in the nation for the 50-breaststroke. Fueled to work harder, she upped her race to the 100-breaststroke, competing in Junior Nationals and CIF all four years of high school. It wasn’t until age 20 that she swam her last competitive race. As she got married and had two children, her time commitments were placed into her family rather than the pool, but her passion for the water never died. When the kids grew and entered school, she had to help provide some income and couldn’t find any jobs that fit into school time. Plans for a backyard pool already underway, she had the epiphany that her love of swimming and love of children could be combined into a dream job. With a passion and a pool, she decided to offer swim lessons out of her backyard. Her motivation to start this small business was to offer a service that would help save lives and impart a love of swimming. Her hope was that all students who came through her backyard would find confidence in the water and that the confidence would enable them to safely get out of any potentially stressful swimming situation. Because there are so many pools in our community and the ocean is not too far away, she wanted to offer everyone the opportunity to find their confidence in the water. This dream and vision catching momentum, all she was missing to start her business was a name. She sat in her backyard looking at the freshly built pool and thought, “Swim to Casie sounds stupid… but Swim to Shore sounds perfect!” To this day she stills jokes that she married the right guy. With the decision to make the business name a play off their last name, it was time to get the word out for summer swim lessons. This entry was posted in Uncategorized and tagged backyard pool, breaststroke, Casie, history, race, small business, Swim to Shore, Swimming on October 1, 2015 by 11975344. Swim to Shore Swim School 25395 Madison Ave.